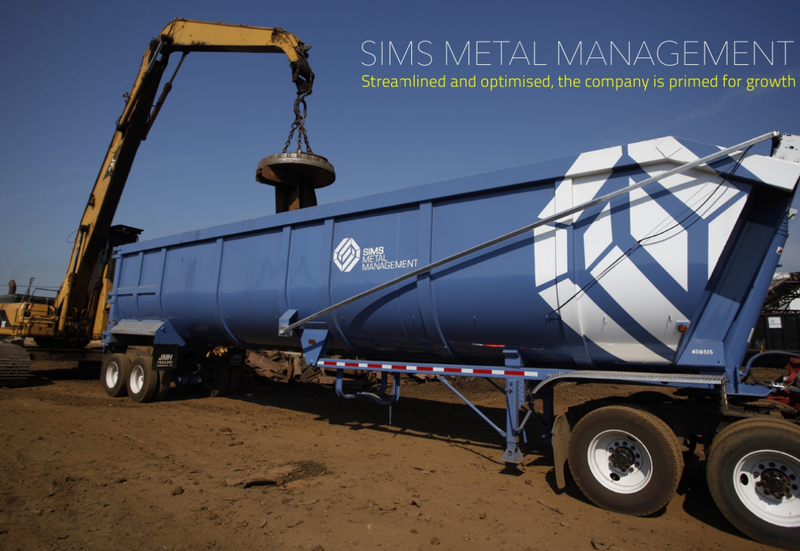 Following a merger in 2008 Sims Metal Management became the world’s largest listed metal recycling company. However, that spelled one of the most trying periods in the company’s 100-year history as the steel industry collapsed and global prices fell through the floor. The company had a negative cash position and a profitability level close to breakeven when the current CEO Galdino Claro joined in 2013 and has stewarded Sims through the hard times with efficiency and innovation, now the company has a platform to pursue growth and continue to dominate the global metal recycling industry for another 100 years. Claro implemented a five-year ‘streamline-optimise-grow’ strategy to return the company to its former glory. Between 2013-2108 Sims would not pursue any meaningful growth opportunities but is focused on identifying the core business units within the organisation, divesting non-core assets and re-optimising the core business to improve sales capacity, improve profitability and substantially decrease the volume breakeven point. “At that stage  we thought we were at the bottom of the cycle but things continued to deteriorate substantially, however Sims took a different direction and we improved our performance from the base in FY2013 to where we are now,” remembers Claro. The first stage of the strategic review was for Sims to exit any business units that were not proving to contribute to overall growth or profitability. This began with divesting recycling facilities that were buying scrap in direct competition with Sims customers, local steel mills, and trying to sell back to them. It was an unlikely business plan and the firm divested the assets by selling them to the steel mills themselves. Secondly, there were technology developments that Sims was pursuing in electronic recycling at the time which were not generating the returns that Claro expected and there was no business case to continue developing them so those operations were shut down. It meant that with Sims’ core business identified the primary task was to optimise every facet of the operations to squeeze out every last drop of profitability. Claro concentrated on tightening up the logistics of the operations as a starting point. “Logistics is a huge part of what we do. Our margins are so narrow that if you do not have a very well-established flow path from where the material is generated to where you process it and how you access the customer base, it becomes almost impossible to make money,” Claro explains. Sims focused on streamlining the logistical operations as far as possible. Everything that could be barged instead railed was as well as everything that could be transported by rail instead of road all to reduce costs. There was also a move to focus the technologies to maximise efficiency, reducing the number of times material was touched from generation to consumer consumption. The second area to focus on to drive profitability was manufacturing excellence. Sims implemented a programme of redesigning its internal manufacturing operations, bringing in modern concepts, reducing overheads, improving material recoveries and putting in place mechanisms to ensure best practices were communicated across the company. The third strand was a focus on improving the quality of what Sims buys and sells. It involved working with its customers, in both ferrous and non-ferrous metals, to understand their profit models and how Sims could add value to their operations through the quality of the materials it supplied. The final area of optimisation for the core business was to identify how the working relationships with Sims’ supply chain could be improved. There were discussions to understand how Sims could better support its suppliers and give them more transparency to commodity price fluctuations. Claro encouraged the suppliers to work smarter to establish a continuous flow of products that would minimise the supply chain’s exposure to commodity price oscillations. “Through those four initiative: supplier relationships, quality, operational excellence and logistics we transformed our business. We dropped our breakeven point from close to 12 million tonnes per year (mtpa) to 7mtpa while preserving our production capacity completely,” states Claro. The company’s returns on capital has improved from near 2% in FY2013 to approximately 7% in the first half of fiscal year 2017 while the cash position improved from negative to over $300 million positive. The optimisation process began in FY2013 and that year is used as a base for current numbers. The improvement is demonstrable looking at the figures from Sims’ 1HFY2017 results. In 2013 Sims produced over 12mtpa with earnings of $67 million; based on the company public statements for this year’s first half, while production contracted over 30%, annualised earnings more than doubled – a clear reflection of the optimisation process taking effect. The focus now is to complete this optimisation phase through 2017 and then pursue organic and acquisitive growth as the company moves into the next phase of its strategic plan. Claro says Sims is looking at how it can expand the variety of metals it is recycling, identify brownfield, greenfield and acquisition opportunities and look at new regions where the dynamics for metal recycling exist but Sims does not currently have a presence. The formal growth plan will be outlined around the AGM in Australia in November but Claro explains the key areas that will be targeted. Before pursuing growth, Claro stresses how important base retention will be. Having made the significant achievements in bringing the company back to profitability the core business can’t be ignored in favour of new businesses. “Nothing we do in terms of growth should compromise the efficiencies of the core business. One of the most important aspects of our growth strategy is to develop processes and implement them to protect and continuously improve our existing business,” states Claro. The processes to protect the existing business include control initiatives, operational excellence, continuity in production and the Sims University – an education platform to make sure whenever a best practice is developed it is disseminated through the business and employees get the training to incorporate the practice. The first branch of the growth process will be to grow Sims’ market share. Claro says this will include extending the purchasing network, buying from far reaching suppliers that are currently to expensive logistically and boosting volumes to supply to customers who desire more product than Sims can currently produce. “As an organic growth initiative, there is an opportunity to extract more from the same core operations. Organic growth is always the simplest and least expensive way to grow a company and it’s the first pillar of our strategy,” explains Claro. Secondly, Claro wants to bolster the company’s market positioning. He says there are a number of locations which are primed for Sims to move into but it hasn’t yet. For example, the Netherlands has all the required infrastructure, good port facilities, access to water, a flow of ferrous and non-ferrous secondary metals and favourable logistics. Claro also explains that there is a wealth of opportunity in different metals that Sims has not taken advantage of yet. Looking at zinc, chrome, molybdenum and rare earths recycling there are huge opportunities and compatibilities for Sims to grow. The sources of the secondary metals are similar, the processing is technologically compatible and Sims already has a customer base in place that would provide ready demand for those metals. The final piece of the puzzle for growth will be to look at potential business adjacencies that can be incorporated into the company. Sims is already managing New York City’s municipal waste recycling and Claro observes that this kind of model could be repackaged and applied to cities and regions across the globe. The company is celebrating its 100th-year anniversary this year. A century since Albert Sims created a Sydney-based glass recycling company. Claro is working to ensure the company is in a healthy position not only to exist for another 100 years but also to make Sims a broader recycling company that is focused on providing better life conditions for future generations. Part of that plan is to diversify its operations so Sims is not so heavily exposed to the volatile metals market, or even within that to leverage against being over invested on the steel price. “One of our major objectives with the diversification of the portfolio is to overcome potential commodity price oscillations by understanding the cycle of those commodities,” notes Claro. There has been a cultural shift in business and on a more local level away from throwing all rubbish into landfills to finding a way to recycle and repurpose it instead. Claro wants Sims to be thought of as a key part of that process. The challenges of the metals market since 2008 have deviated the company’s attention from that goal, but now it is back in the black Claro hopes to consolidate Sims’ position as the number one listed metals recycling company in the world. “We couldn’t think about growth if we weren’t making returns on capital and if we didn’t have a strong cash flow to support that. You can’t think about growing if you are fighting for survival.